Christmas is an interesting time of year to play at being your own pancreas. 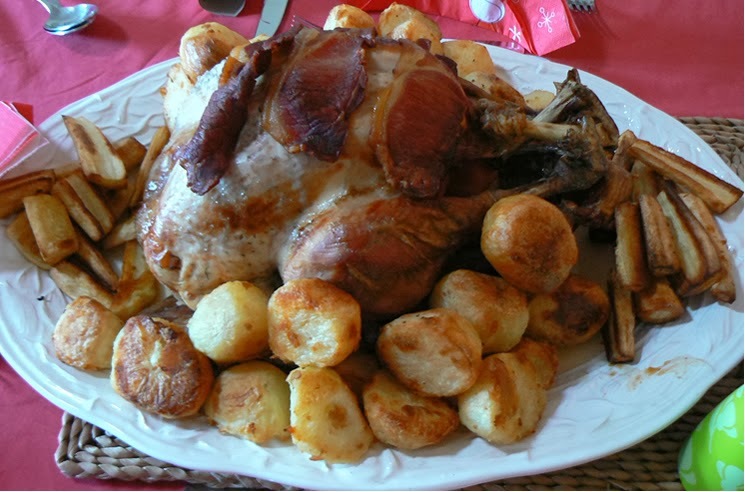 The main Christmas Day meal itself is usually *ahem* relatively easy (especially since I adopt the traditional standpoint of 'no carbs count' for Christmas and birthdays). As meals go, it is big... it is rich... and it will probably involve a pudding the size of a bowling ball... But it is basically just a roast dinner and it is only one day - and you can't expect perfection all the time right? However, on an alarming number of occasions either side of the 'big day' I find myself faced with my own particular food nemesis - a creaking table full of buffet nibbles. Each little carb-laden, high-fat morsel smiling sweetly up at me daring me to have a go. A festive tipple or two to blur my judgement and weaken my self control and you can see that these meals fall firmly into the 'high risk' category. Which is quite an odd way to look at food really... But I've been doing it so long that I hardly realise I am doing it. Over the years it has seemed logical to me that consistency in terms of food intake is likely to be a good strategy for Blood Glucose results. It makes sense surely? Eating similar quantities of similar foods should allow me to try out a number of dose and timing variations until I find one that works. Then I can eat that same meal any time, and get perfect results. Tried. Tested. Predictable. Easy! Other meals are much harder to calculate (read: wildly guess) and almost come with an inbuilt expectation of BG chaos. If you are going to enjoy these... you do so knowing that levels are likely to be less than perfect. Except that it doesn't actually work like that. At least not for me, or perhaps just not all the time. And when it doesn't work like that... When an 'old faithful' lets you down catastrophically, while in the same week a 'wild stab-in-the-dark' guessfest comes out not too bad, you begin to wonder why you are bothering to make those careful choices in the first place. When it comes to playing the BG boardgame (not so much Snakes and Ladders as Spikes and Hypos perhaps? ), my diabetes, like some cantankerous elderly maiden aunt who hit the sherry early on is a big ole cheat. Not averse to completely changing the rules when it suits, or simply behaving in a completely baffling way. Even *if* I were to eat exactly the same items of food, in exactly the same quantities every single day. Even then, I still could not expect 'perfect' BG levels (whatever that means) to last for long. The consistency conundrum is simply that carbs, doses and timings are only a small part of the picture. There are a lot of other factors in play that can combine (or conflict) to significantly alter the outcomes for the most self-disciplined diet. Douglas Adams, The Hitch-Hiker's Guide to the Galaxy. In my heart I know that trying to reduce the number of variables involved in juggling my BGs is the 'percentage approach'. After a few days of winging it I usually have had enough misses for the illusion of SWAG invincibility to have worn off. So I'm reeling my choices back in again, and aiming to lose some of the wilder swings I've seen over the past week or two. It will always be a balancing act. Along the line between complete dietary freedom at one end and monk-like self control at the other there is a place where each person with Type 1 Diabetes will feel comfortable, both with the food they are enjoying, the effort they are putting in and the results they are seeing. Good luck in finding your own balance.